Brain Age 2: More Training in Minutes a Day! 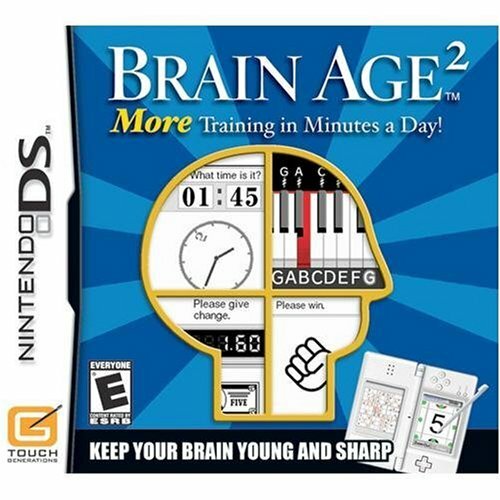 is the sequel to Nintendo\'s 2006 smash hit Brain Age: Train Your Brain in Minutes a Day! Just as before, your brain age is ranked from eighty years old to twenty, with twenty being the best. If your brain needs more work, this game offers exercises to help you get it into tip-top shape! What kind of game is this, and how is it different from Brain Age? The Brain Age series is the product of collaboration with Nintendo\'s designers and Japanese neuroscientist Dr. Ryuta Kawashima. The idea is that by working your brain in specific ways, specific areas are stimulated and exercised, just as physical workouts affect the associated areas of your muscular system. In this way, Dr. Kawashima and Nintendo want to see you not only enjoy their software, but improve your skills in several areas. The game measures your progress via a score called \'Brain Age\', with twenty being the optimum, quick-thinking mind and eighty being older and slow. Brain Age 2 is a whole lot like its predecessor. The basic framework is the same: You create for each player one of four profiles, where your current Brain Age and training history are stored. You are then tested for what your current Brain Age is. After this is established, you are encouraged to perform daily training. The game never complains about how much you train per day, as long as you do something. It does reward you for doing at least three training exercises a day, however. Dr. Kawashima will let you know he\'s missed you if you miss a day (or more). Though not required, you are also encouraged to perform a Brain Age test periodically to gauge your progress. The Brain Age tests are different than the ones you train daily with, so there is incentive there if you wish to get the most out of the software. While there is a lot of similarity, in both substance and style with the original Brain Age, the exercises are substantially refined over the previous iteration. Though perhaps in some sense they are less \'pure\' to the Dr.\'s research, as, for example, there is a lot less \'reading aloud\' in this iteration, each exercise is a lot more fun on their own, and it well addresses the bugs or limitations of Brain Age. To take \'reading aloud\' as an example, in Brain Age this was neat, in that you could read small excerpts from classic literature and learn something as you read.. but there is no built-in game mechanism to know whether or not you are cheating. Now there is a neat Word Scramble mode that asks you to unscramble the word using all available letters shown. Instead of the pure Calculations x20 and Calculations x100 as before, there is now the excellent Sign Finder and Math Recall. This pattern continues on to other training games. Though similar in many ways, these are just more fun in my opinion. There are also some fun extras. As before, there are one hundred Sudoku puzzles included, all new. There is also a very good touch-screen driven Dr. Mario clone called Virus Buster. This is not a \'training\' game per se; it\'s there to \'help you relax\'. The idea behind Dr. Mario (and Virus Buster) is that there are several visible viruses of one of three colors, and you can eliminate them by aligning four of any of the same color. This works for viruses or medicine, which drops in a two ended pill, which can have two of the same color or any combination of the others. It\'s a fun game, and Nintendo\'s answer to Tetris back when these games were new. Including this mode in Brain Age 2 is a great idea, especially for those who may not have been willing to give the brain training games a try the first time around. It also works really well, even if they took the music from Dr. Mario and slowed it down to make it more \'relaxing\', which is a mixed bag if you liked the original a lot like I do. The harder difficulty levels eventually throw more than one pill at you at a time, which can make for some hectic stylus dragging. It\'s also neat how you can move any falling pill, even ones that were freed through combos. My favorite of the new modes is probably the Piano Player mode. In this game, you are shown a touch screen piano, which covers one octave, for example from middle C up to the next C note. On easy mode, your keyboard has the notes printed, and sheet music with the notes written there also are printed as the musical notes scroll by. The game waits for you to press the right note. On hard mode, not only are all the note cues (or cheater letters) missing, but the game does not wait for you to press the right note, expecting you to time it right as well. It\'s a lot of fun to try to play classic, simple piano songs along with the DS. Most of the music is recognizable, with even a few popular hymns, like \'Joy to the World\' and \'Nobody Knows the Trouble I\'ve Seen\'. As you play that training mode more, additional songs are unlocked for you, so it\'s definitely worth it to play that one every day! There is also a simple multiplayer mode that can use the Nintendo DS\'s download play feature for up to sixteen players. I have not been able to test this feature. Overall, I have been very pleased with the subtle but noticeable improvements in this rendition of Brain Age. What about the graphics and sound? This game is not about the graphics or sound at all. It has a fairly clean interface, with very little to no frills or extra colors. Most training modes are completely black and white, utilizing stick figures and things like that. I don\'t really consider this a large drawback, and it\'s most definitely an intentional, stylized look. The only thing that is drawn in 3D that I can think of the the face of Dr. Kawashima, and that is rendered in an intentionally low polygon manner. Again, it\'s not even important to the design of this game for it to look flashy at all, and its simple design may appeal especially to the non-gamer in Nintendo\'s target audience. The sound and music is similar in that is covers the basics. It continues to represent a consistent style from the previous entry in the Brain Age series. It has simple sound effects here and there, and the Piano Player training game has authentic sounding piano as a part. How appropriate is this for Christians? This game is perfectly appropriate, even to be encouraged. Exercising our mind is something everyone should take part in, whether it\'s from reading, writing, studying, discussing, or playing Brain Age. Wink I enjoyed the few hymns I heard, especially \'Joy to the World\'. Brain Age 2: More Training in Minutes a Day! is a good sequel to a great start by Nintendo who is trying to get us all to keep our brains young. For fans of the first Brain Age, I wholeheartedly recommend this one. If you are sick of the first, this one may or may not be what you are looking for. I also found the challenge of the exercises here to be a definite step up from the first Brain Age. If you\'ve been interested but never have taken the plunge into flexing your gray matter on you Nintendo DS, even with the difficulty factor, this is probably the best place to start.